UTAH – Field work has officially begun for Team Utah, Version 2.0. The team consists of three Wooster seniors (Kyle Burden ’14, Cam Matesich ’14, Candy Thornton, ’14) and two Wooster sophomores (Adam Silverstein ’16, Michael Williams ’16). Tricia Hall (’14) is a returning member who has graciously agreed to stay in Utah after her IS field work to help us with our data collection. This year, we’re also joined by Dr. Thom Wilch and two senior geologists (Ellen Redner ’14 and Ben Hinks ’14) from the Albion College Department of Geological Sciences. Needless to say, we’re a small army, and we’re ready to find the answers to questions raised during last year’s reconnaissance investigations of Ice Springs Volcanic Field in the Black Rock Desert. 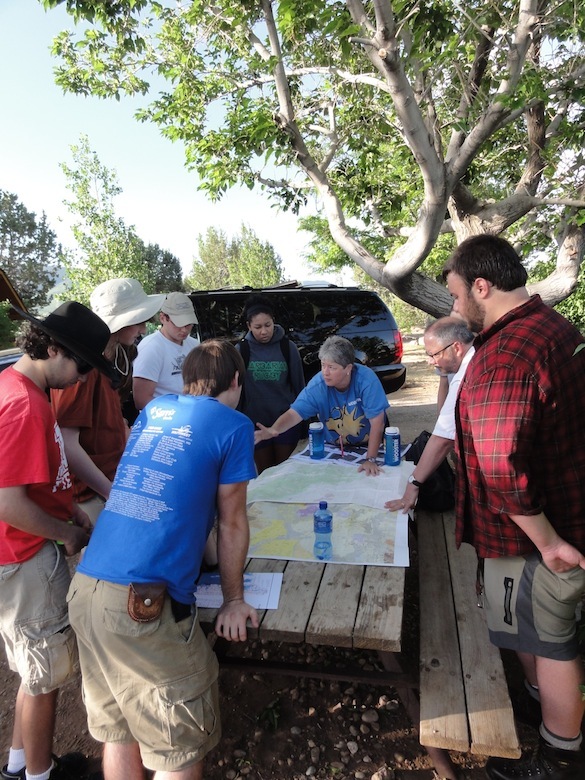 Dr. Shelley Judge gives a brief overview of the local and regional geology before heading out to the field. We began the morning at the top of the cinder cone and found a new exposure that was uncovered in the last year. It’s actually a wall of welded bombs and spatter. 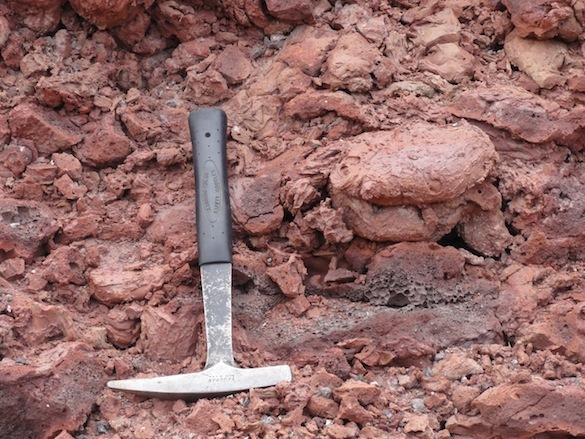 These blobs of lava were ejected explosively during an eruption and fused to one another on the rim of the cone. 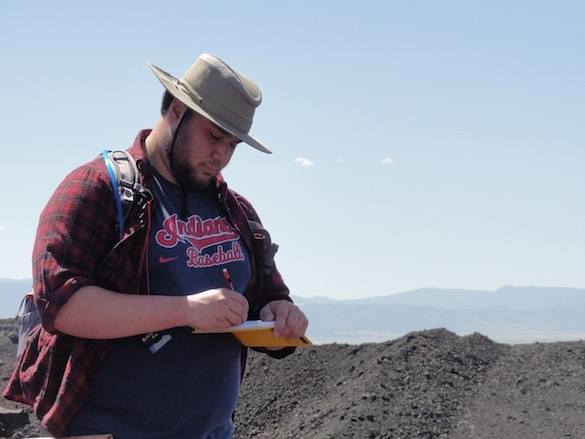 Kyle Burden (’14), shown here taking careful notes, will be working on the welded bomb wall using an approach similar to the one Team Iceland used on pillow lavas. He’ll be collecting high-resolution images with a GigaPan and making careful measurements of bombs across the exposure. After a morning on the cinder cones, we descended into the lava fields. 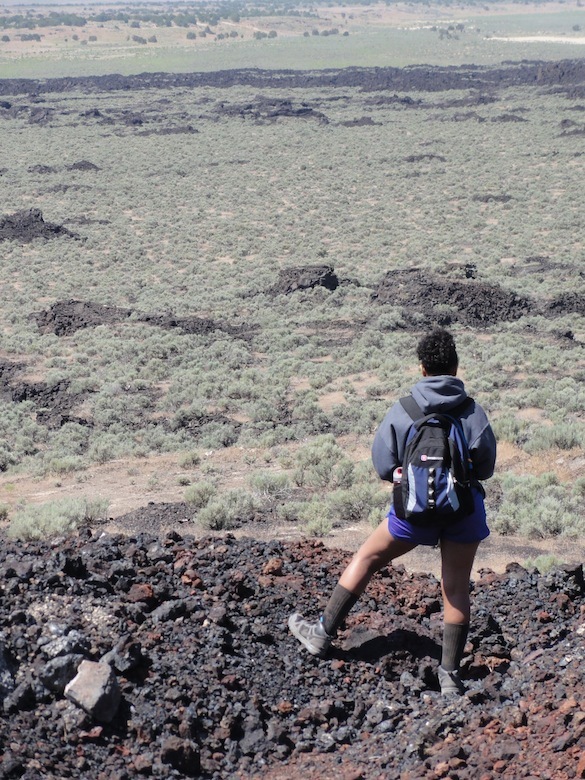 Candy Thornton (’14) contemplates her field area. 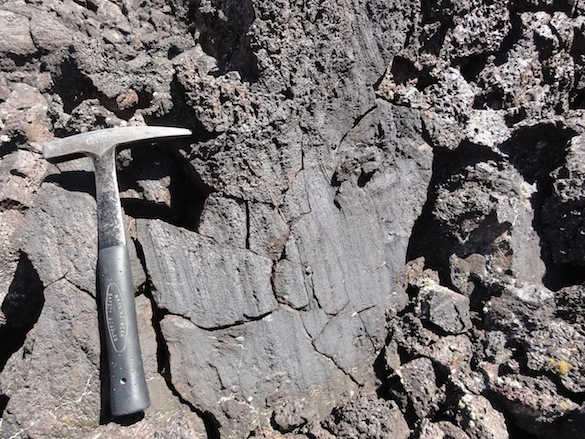 She’ll be documenting features in the lava flows to determine whether they inflated as they were emplaced. One of the features that Candy will be studying are these striae, which are grooves that formed on the sides of a mound called a tumulus. 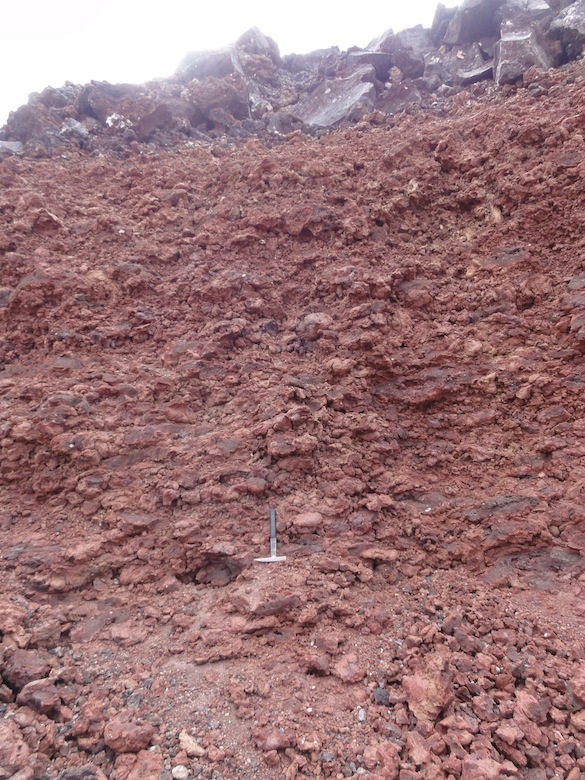 The striae indicate that the interior of the mound moved up relative to the outer crust while the lava was partially molten. What a great team assembled there in beautiful Utah. Team Iceland must be feeling the change from cool rain to hot breezes. Love seeing Kyle’s Indians shirt spreading the word. Someday I want to see a wall of fused bombs. Looks like a great team. I am looking forward to the gigapan images and round two results of team Utah with Albion collaborators.